Our possum removal technicians service all South-East Queensland. 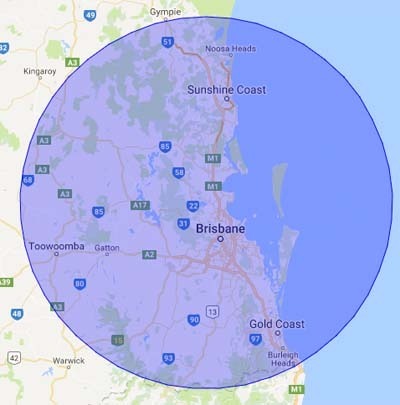 This includes the suburbs of Brisbane, The Gold Coast, The Sunshine Coast, Toowoomba and all areas in between. We have experience in all ares of SEQ and especially around the outer suburbs of Brisbane (where new developments encroach onto possum habitat) and in areas near nature reserves. Take a look at the list of suburbs below for specific information on your local area. These pages linked to from the following list will provide information specific to your local area if we service your locality. If you cannot find your suburb, town or region listed below but believe if should be, please get in touch with us and find out if we have accidentally missed you out. We will then update our service area list to clarify this mistake. If you like so many other Queenslanders have a problem with possums bothering you, either inside your ceiling or outside around your home or on your roof, we can help. Get in touch with one of our friendly staff today to find out more. We love to help our local South-East Queensland community and we look forward to hearing from you. Our dedicated team has decades of experience in the possum removal and relocation industry and we are sure we can find a permanent solution to your troubles.